Despite its collection of near-misses in California (LACMA, The Broad, Universal, etc. ), OMA and Rem Koolhaas keep trying to land a headlining project in the Golden State. And it looks like they’re about to design a high rise in San Francisco to accompany their (currently on hold) winning scheme for a mixed use project in Santa Monica. 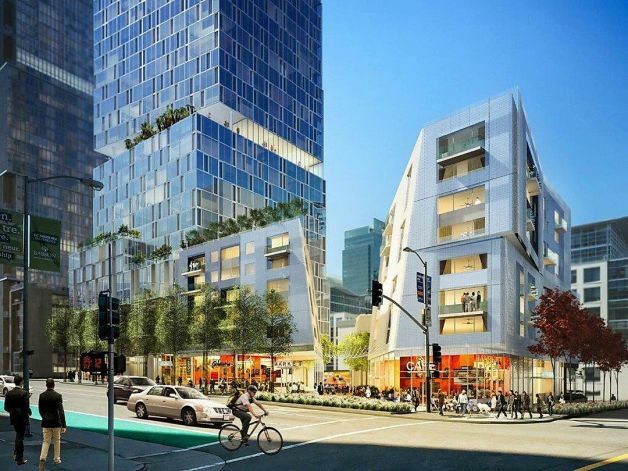 San Francisco’s Office of Community Investment and Infrastructure (the successor to the city’s Community Development Agency) has given the firm initial approval to design a 550-foot-tall residential tower on Folsom Street, between First and Fremont streets, in the city’s Transbay area. The project features OMA’s tower on one end of the block with podium buildings and townhouses filling the remainder of the block. The tower, and the accompanying row of low rises designed by Fougeron Architects on Block 8, will be a mix of 4,400 condominiums and rental apartments, with at least 27 percent of them affordable. CMG will be the landscape architect, and the developer is Related California. OMA said that it could not yet release images of the design, although several press outlets have released a rendering (at top), including the San Francisco Chronicle. OMA becomes the second starchitect-firm in a matter of weeks to take on a skyscraper in the city, after Jeanne Gang recently signed on with Tishman Speyer to design a tower in the same neighborhood. 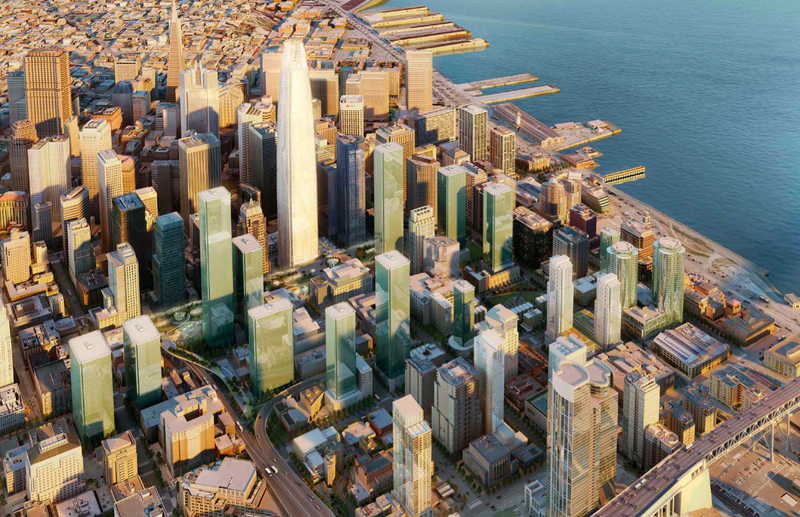 Both towers will be located near Cesar Pelli’s Transbay Tower, now underway. The 40-acre Transbay area has been witnessing major developments since the city and county of San Francisco adopted plans to redevelop the area in June 2005. Under the plan, the city divided the area into two sections. Zone One encompasses a ten-acre segment of vacant public land where a portion of the Embarcadero Freeway once stood and will include a mix of residential, retail, and public open space, as well as a one-acre park. 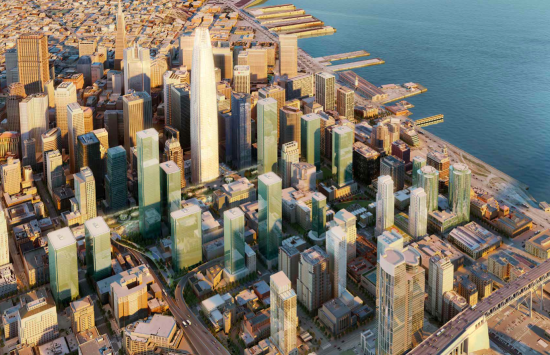 Zone Two will include the new Transbay Transit Center and the 1,070-foot-tall tower by Pelli Clark Pelli Architects. The plan is set to expire in 2035. 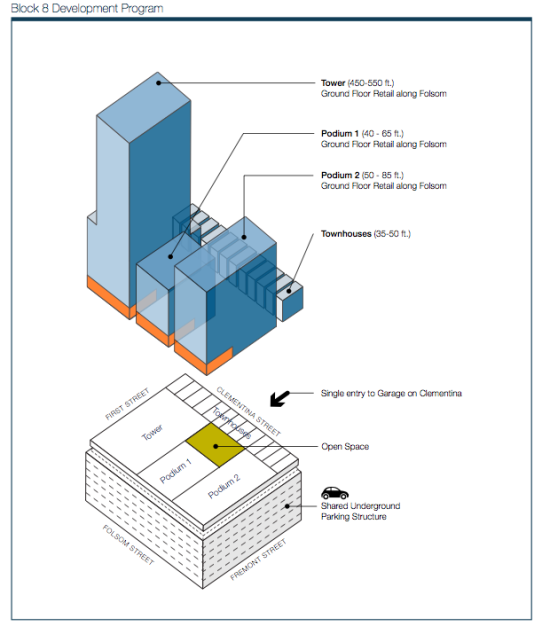 More planning details on Block 8 in a report by the Office of Community Investment and Infrastructure here. 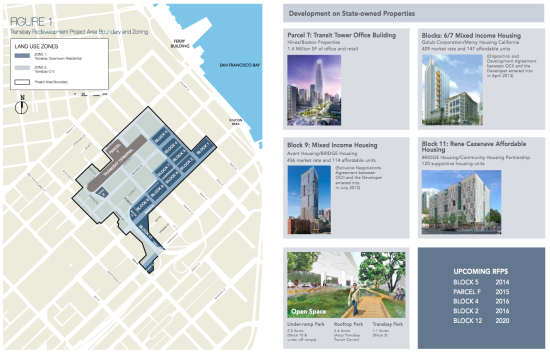 And more on the Transbay redevelopment project here.